My Review: As an American, I went into this book with the hatred of terrorism and Islamic extremists firmly intact. I consider myself fairly educated on the war, American politics and all the stuff that comes along with that. It has always seemed very simple to me: we are right, they are crazy. 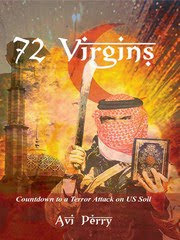 72 Virgins is a story that takes you into the very heart of Islam, the very souls of the young men that give their lives in the name of Allah. It was slightly disturbing to me when I caught myself....caring. Such young minds being flushed with these beliefs. Perry seems to take you inside, makes you understand how influential the "brainwashing" that these people go through really is. It is a very intense view of what goes on behind closed doors in this country as well as theirs. The plot reads like a wonderful thriller, but brings facts and figures to life. The writing is strong, and it is obvious the author was embedded in the system. His information is at once terrifying and fascinating, his emotional telling of these characters story is heart wrenching. It took me from angry to sad to elated and back again. I would recommend this to anyone who wants to educate themselves on this culture, but doesn't have the patience for text book type reading. It is thoroughly entertaining and exceptionally plotted. Sum it Up: I believe many people would benefit from the information in this book, and I think that it gives insight into things we would all rather not see at all.